A couple more links (there's a ton of them) with articles on the new Concours 14. One has a video of the traction control in action. Not a big turn-out for the Friday night ride this week and only a short little ride over the Saddle, back through Balance and over the track to the Summerhill shopping complex for some takeaways. The ride was marred by one guy falling off at very low speed when he braked in some gravel on the side of the road. No injuries to the rider and very little to the bike as well. Still not something that we want to encourage on these rides. I hope the rider is more careful next time out - it is not a race and nobody should feel that they have to prove anything. Hopefully we'll get a few more next week and can plan a decent pootle somewhere. Yep, the VTR is coming up on 24,000km and so this week it went in for a service and a new rear tyre. She came away with a clean bill of health and a brand new PR2 on the back. I decided to fit the PR2 to the Honda after having such a good run with them on the Connie. The previous tyre on the Honda wore out the centre well before the side so I figure the harder compound in the centre of the PR2 might work out a bit better. I think when it comes time for a front I'll go with a slightly softer Pilot Power on the front as the Honda is a lot lighter and more sporty than the Connie. It will be interesting to see how that combination works. I got to watch the Doctor take out his 9th world title last night in pretty bad conditions. 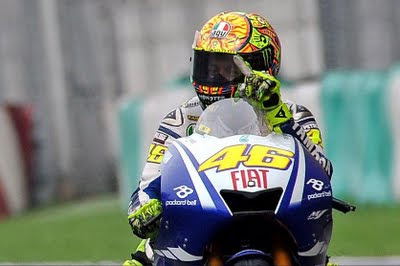 The race was delayed for quite a while due to a pretty wet looking thunderstorm and the track was wet for the duration of the race but Rossi was able to do more than what he needed to clinch the title by finishing 3rd ahead of Lorenzo. Fantastic! Hats off to Stoner too who just cleared out from everyone to finish a good fifteen seconds ahead of second placed Pedrosa. Awesome watching these fantastic riders hanging it out in the wet! After finally getting a bit of sleep in our nice warm & dry motel it was nice to wake up a reasonable looking day and think about getting on the bikes again. We'd already decided that if the weather played ball we would be heading home via Taupo and Napier so that we could have breakfast at the Summit Cafe on the Napier-Taupo road. Well, the weather looked just good enough and the forecast was good so it was all go for the brekkie run. We packed up the bikes and hit the road to Taupo. We had a quick pitstop just out of Turangi for gas and with sunglasses (wow!) on we were off. After our big ride we were happy enough to just take things quietly and enjoy the scenery but once off the plains and into some corners it was a little hard to hold back - although I had unpleasant memories of a ticket on the Taupo road last time I was on it to keep me from getting to carried away. Although it was still quite cool the sun was definitely out in force and it was very nice riding conditions and we were soon pulling in at the summit both really looking forward to some tucker. We were in for a very nice surprise too - the cafe is very bike friendly and we got free coffees with our brekkie. My mocca was fantastic and the cooked brekkie went down very well. Stuffed to the gills we continued on our way eventually coming of the magnificent hilly bits and dropping into the Esk Valley. On our way through Napier we stopped in to see Dad as he was keen to hear about the ride and then we made our way out of town and onto Highway 50. Highway 50 was great - both of us could ride it in our sleep and we just cruised on down enjoying the ride and the views. A great day to be out on the bike for sure. We stopped briefly in Dannevirke so Mark could get gas while I decided to try to make it home on the tank as I was getting very good economy. Just a little ride of 362km and economy of 5.25L/100km - outstanding! 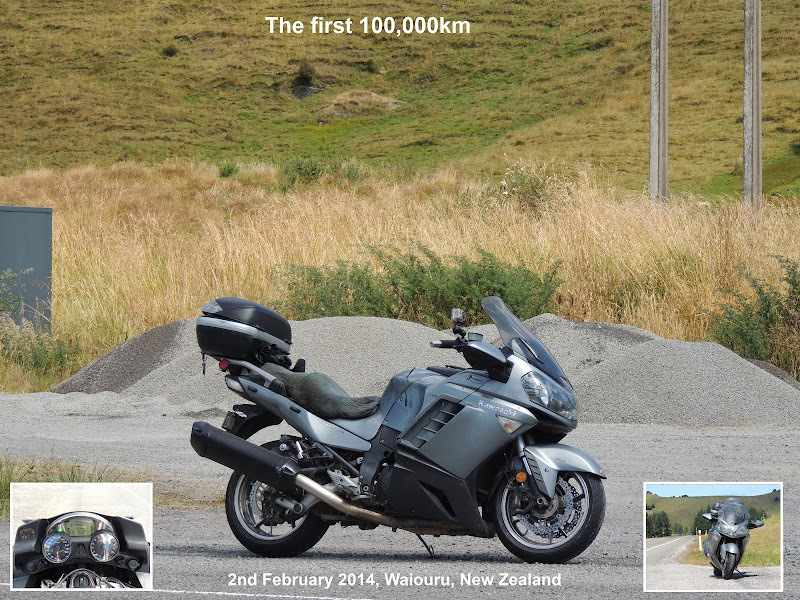 Right, so I got home yesterday after a great ride back from Turangi via Taupo and Napier (more on that later) so it's about time that I finally wrote up my report on the Grand Challenge. 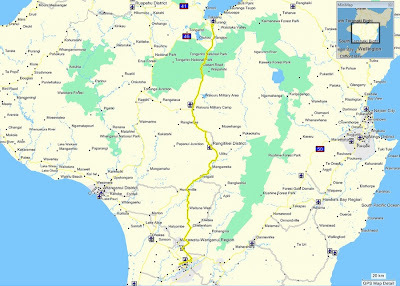 As mentioned in an earlier post Meanie, Cowboys, Mark & I rode up to Turangi on Friday afternoon, got wet in a few places, got the bikes scrutineered, had tea at the truck stop and parked up at the motel to put the route maps into Mapsource. Over the course of the night we had a lot of rain with it waking me up on a couple of occasions - it was that hard. The rain also played a part in a particularly annoying incident overnight - the Connie fell over on her right side sometime in the middle of the night. Luckily there was very little damage apart from a broken mirror because she had her cover on and this prevented any scratches to the fairing etc. Still very annoying and mirrors are $170 to replace. Come morning we got up, picked the Connie up off the ground and spent the morning just relaxing until Meanie turned up to take us off to breakfast - at the truck stop again. After brekkie we fuelled the bikes and headed down to the motorcamp to await the kick-off. We spent the next 3 hours or so just relaxing and chatting to other riders and being impatient. Eventually it was time for the rider's briefing and then to start getting ready for the ride. Cowboyz and Meanie were a couple of groups ahead of us so got a head start on us that we never managed to make up. Quite funny really - we never saw them at all on the ride but weren't that far behind them at the finish. When we finally left Turangi the weather was fine but we were heading towards some grey looking clouds and new we were in for weather at some stage. Regardless we had dry roads at the start and it was nice to finally be on the road and starting to eat into those 1,000 miles we had to cover. Mark and I had decided that we would make our first fuel stop early at Te Awamutu as this would easily give us the range to get to the first proper checkpoint in Whangamata. We weren't the only ones with the same idea as a few others pulled in behind us. We quickly fueled the bikes and were soon on the road again. At Whatawhata we turned West onto the Raglan road and the time checkpoint (no ticket punching here) at Te Uku. This was a new road for me to ride and what a road! Lots of delicious corners and some of them were even dry! At Te Uku we didn't even shut the bikes down and were very quickly onto some lovely back roads to Huntly - slightly windier than the Raglan road but in great nick and we fell in behind a ZZR-1100 who was getting along quite nicely. After a very short stint of Highway 1 (sucky-moto) we were back onto back roads heading towards the Coromandel. These roads were all good and I can't remember it being too wet either so we made pretty good time. The only boring bit was the big long straights coming into Kopu and it appeared that these had got the better of one Blackbird pilot as when we went past him he was having a nice chat to a police officer - sucked to be him! 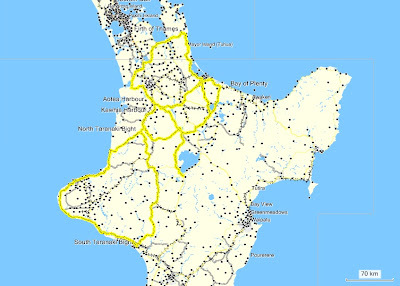 From Kopu we rode over the hill to the Whangamata checkpoint- a great ride, more hills and delicious corners. Here we got our cards punched, filled the bikes and had a quick bite and drink before disappearing off into the gathering darkness. 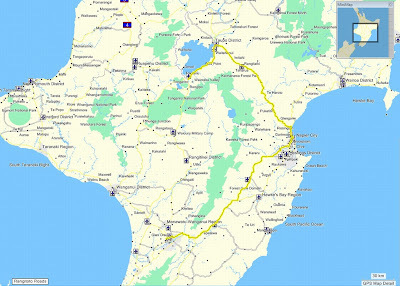 Over the hill to Waihi and then just after turning off at Bethlehem we ran into the first issue with the GPS map. For some reason it decided to take us in the wrong direction and onto a gravel road - this can't have been right so we turned back and eventually found our way onto Pyes Pa road and heading in the right direction again. It was quite wet again through here and we had to negotiate some nasty road works before finally cruising into Rotorua and back onto some familiar roads. Cutting across Highway 30 through Atiamuri, Whakamaru and Benneydale was all familiar territory and even though it was very wet we clipped along nicely. Dropping down into Te Kuiti I was feeling a little crappy so it was nice to stop and have something else to drink and eat at the checkpoint. Just after midnight we were on the go again and it was great to be doing roads you know in the wet and dark conditions. The only concern we had was the state of the Paraparas given the weather we were experiencing. It was very wet from Tamarunui through to Raetihi but pretty easy going and when we finally hit the Para's they were not really an issue - just one patch of muddy road works and a few slips here and there - oh and plenty of moisture. At the Wanganui checkpoint Mark was feeling a bit crappy so I led us off around the coast. Unfortunately our rushing at the checkpoint meant another unscheduled stop on Opunake for a comfort stop but it was quite nice standing under some shelter as a real downpour hit for a few minutes. Continuing around the coast to New Plymouth was a bit of a mission as it was now not long before dawn and this always seems to the time of day that is hardest to get through - tiredness really makes itself known and concentration can wander if you are not careful. So it was good stop again at the New Plymouth checkpoint and have a coffee (my only one for the ride and I normally never have them on the GC) before pointing the bikes Northwards again. As we rode out of New Plymouth the skies were beginning to lighten and with the growing light came our second wind and the hope for some sun. The sun didn't seem that keen but as I took the lead it was nice to hit Mt Messenger and the Awakino gorge (very wet) again. We splashed our way up the road and then turned East at Kihikihi to Putararu. We actually had a very good ride through here with no mucking around and Mark and I were joined by Steve on his 'Busa and another guy on his Beemer - all happy just to tuck in behind us. At Putararu Mark and I gassed up for the last time while Steve chanced it and went on ahead of us. From Putararu we got take in the Kaimai's - a great ride in the dry but we got to sample it in the wet (although the sun was also shining at the same time) as we made for Tauranga and the last checkpoint at Te Puke. At Te Puke we met up with Steve again and after having our tickets punched we were keen to get started on the last leg back to Turangi. Once again we had to pick our way through Rotorua before crossing through Atiamuri to Whakamaru and finally Turangi. All the way we were still in and out the rain and at one stage it looked like we'd get some fine weather but as we dropped down into Turangi it really hosed down - just great. Following our lunch we said our goodbyes and headed for our motel, a hot shower and bed. All done for another year! It's quite a novelty for me to be able to sit in a motel and post a blog before the Grand Challenge so I thought that I had better give it a whirl. We rode up to Turangi yesterday afternoon through some small patches of quite wet rain and some very windy conditions but got here all safe sound. The bikes have all been through scrutineering and all passed so it looks like we have to do the ride. Later on we went down to the truck stop for tea and then back down to the camp to get the route map. This is the first time Mark & I have seen the map the night before the ride but it is also the first time we've had a GPS for navigation. So after grabbing the map we headed back to our motel where we started putting the route into Mapsource. We are pretty happy with the route we've planned but loading it onto Cowboyz computer his map and mine do not match. We finally worked it out that we had different mapsource files and the two were not quite the same and caused the maps to look different. Nevermind, the map is now loaded onto the GPS and we're sitting around waiting for the 3pm start...hope the weather is not to forecast. Looks great carving up some pretty neat looking roads. Yep, only 7 seven days to go to the GC. I have to say the way the weather has been lately we seriously need spring to kick in - snow closed roads and icy rain will not be welcome next weekend. But anyway, today I continued with my preparations by washing and polishing the bike and changing the oil. All I gotta do now is polish my boots, pack my bags and I'm gone - that and get through a few more days at work...doh! 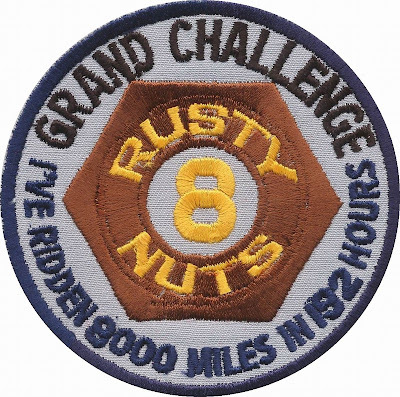 Yep, the Grand Challenge is just over a week away and it's time to start getting ready. The first step I needed to take was to replace the rubber on the Connie. The first set of Michelin PR2's I've tried have really proven to be the tyre for the Connie. My first impressions of the tyres were that they transformed the front end of the bike, offering great feel and making it easier to access the great handling of the bike. Over the life of the bike they have offered great performance with no grip issues except in situations when any bike tyre is going to have trouble - road debris, very extreme weather etc. Not only that they have worn very evenly - the harder compound in the rear tyre preventing the usual situation where the centre wears well before the edges of the tyre. The eventually did wear thinner than the sides but it just took a lot longer and I got a lot better tyre life. The fronts also wore nice and evenly although at the end of their life the profile was definitely affected - something really noticeable riding home on the new tyres. So in the end the tyres came off with around 11,800km on them - more mileage than I have got out of a set of tyres for a long time (read: riding smaller, lighter, lower powered bikes). The previous best mileage on the Connie was my first set of Pirelli Stradas that went to 10,300km. A significant difference! What's more I think I could have got at least another 500km out of them - although in the pictures they actually look better than in the flesh. So naturally I'm very impressed and yes the new tyres are also PR2's and nothing is likely to change there in a hurry. Sold! From the hooligans at Triumph! You gotta love a Rocket! A couple of more articles on the 2010 Connie. Mostly the same info but a bit more detail than some of the previous links. Yep, daylight savings has kicked in so the Friday night rides have been kicked off. We've had pretty average weather all this week and it was not looking good for the ride. Add me getting a cold to this and you'd think that I'd have more sense than think about going on the ride. Well, you're wrong! I'm an idiot. After getting home from work I chucked on plenty of warm clothes and my wet weather gear and fired up the Honda. In Ashhurst I met up with the rest of the gang - about 15 or so of us and we followed the normal Friday night ride procedure of plenty of crap-talking before finally deciding on the ride route and getting on our bikes. Riding through to Aokautere there was plenty of wind to add a little interest to the ride and once on the track we faced greasy roads, wind and fog. All the same it was a good little blast and once in Pahiatua the helmets came off for a bit more nattering. In the end I decided not to hang around and spread my germs so I remounted and took to the track again for the return leg. The ride was more of the same although if anything the wind had increased and this had helped clear most of the fog away. Nice to get home without any rain at all though. Not an ideal kick-off to the summer riding season but it's in the books now and I'm looking forward to improved weather and many more great Friday night rides.